This book consists of my American landscape images coupled with short personal stories/essays about the areas depicted in the images. It is comprised of spreads, with the images on the left side and the corresponding stories on the right facing pages. 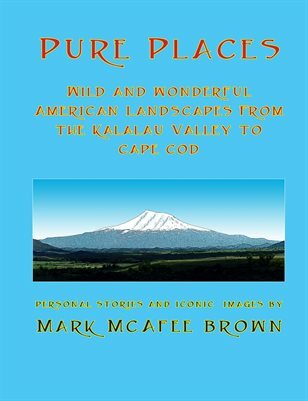 The landscape images are sequenced geographically, from West to East, starting at the Kalalau Valley on Kauai, Hawaii and ending in Cape Cod, at the Eastern tip of Massachusetts, spanning all of America. They are presented in two page spreads with the images on the left side and corresponding stories based on ideas, insights or adventures that happened in or were inspired by the landscapes, on the right facing pages. The stories tell of some of the most dramatic and wonderful days of my life over the past several decades. Some of these places I have returned to time after time and some I have been to only once. These are mostly remote spots and protected parks, but all are still open to anyone with a sense of adventure, a strong heart and two working legs.